Browse: Home / Cow Launcher! 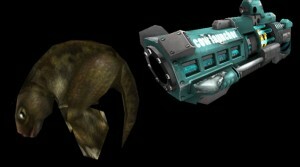 This mutator adds a Cow Launcher to the game. Two different mutators are included. Cow Launcher only mut, this mut only lets players spawn with the Cow Launcher. All other weapons and pickups are removed from the game. The second mut replaces the FlakCannon in any map with the Cow-Launcher, it also replaces the FlakAmmo with little Cows! for you to pick up and reload the Cow Launcher with! Beta2 now available from the link below. This time they chase you!